The project “Resilient Landscapes” designed by AutonomeForme and winner of the Green Good Design Award 2016 is on exhibition at the Contemporary Space Athens of The European Centre for Architecture Art Design and Urban Studies. 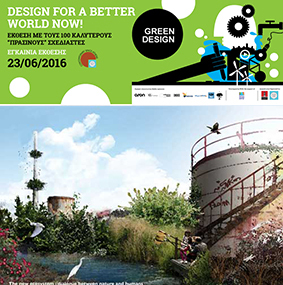 The Green Good Design 2016 award is organized by the European Centre for Architecture Art Design and Urban Studies and the Chicago Athenaeum: Museum of Architecture and Design. The guidelines of the project, entirely developed in Italy, have been de ned through a participatory process starting from the inhabitants instances. Acknowledged for its technical solutions and its design, the project is now part of the permanent collection of Ευρωπαϊκό κέντρο Athens. The opening of the exhibition in Athens will take place Thursday, June 23 at 8:30 am at the Contemporary Space Athens. The exhibition will be open every day until 10 August 2016.